From idling to full throttle, it allows you to fully control the engine sounds as if you were driving a car. Generate any engine speed on demand from a single recording, and get instant access to any detected RPM seamlessly. 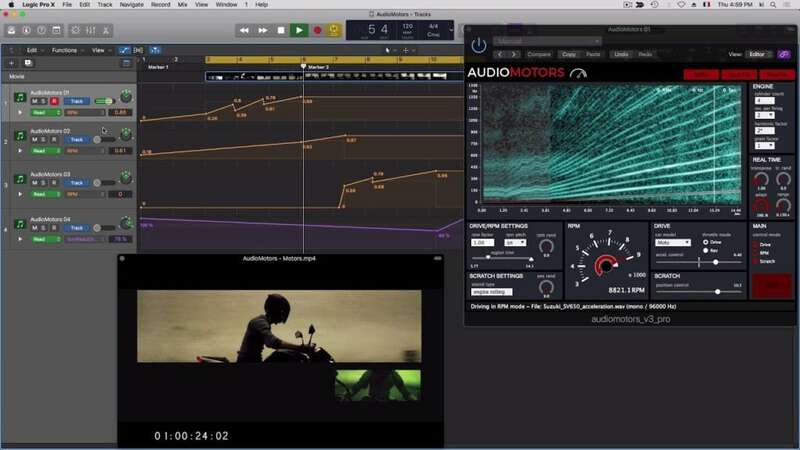 AudioMotors is a sampler designed for capturing engine sounds and creating an instrument. You can load the included recordings or import your own to create unique and realistic sounding mechanical recordings. By using multiple instances of the plug-in in the same session you can combine different engine sounds (interior/exterior/exhaust) even if they came from different sources. The plug-in can synchronize all the sound clips to the same RPM. How Does Le Sound AudioMotors Work? By using multiple instances of the plugin in the same session you can combine different engine sounds (interior/exterior/exhaust) even if they came from different sources. The plug can synchronize all the sound clips to the same RPM. AudioMotors comes with a royalty free sample pack containing 8 cars and one motorbike recorded with high-quality DPA and RODEs microphone: Triumph GT6 MKII, Audi A4 TDI, Formula 2.0 Renault, Volkswagen Golf TDI 2l, Suzuki SV650, Citroen Xsara, Peugeot 308 SW, Peugeot 407 SW, Peugeot Hybrid 508. Design once, run everywhere. Compatible for DAW, game consoles and mobile devices. Royalty free high quality sounds included.